The SRX-R320 projection system, incorporating LMT-300 Media Block, represents the next stage in the evolution of digital cinema - enabling exhibitors to project movies with an on-screen resolution that ensures the best viewing experience available for cinema-goers. It is specifically designed to display 4K movies, 2K movies and high definition 'alternative content' on screens up to 20 metres wide at the highest quality level defined by the DCI. The SRX-R320 builds on the success of the SRX-R220 by delivering the same industry leading 4K projection technology and security performance with a new projector housing specifically engineered to meet FIPS 140/2 security requirements. In addition, the SRX-R320 features a new compact body which increases installation flexibility. The ultra high resolution of 4K provides more realistic images allowing greater audience immersion. 4K movies not only bring the visual experience enjoyed by the director right to the cinema audience but also keeps the cinema experience ahead of HD home entertainment. Offering 4K projection also provides a source of differentiation over cinemas equipped with standard digital projection. Sony’s unique dual lens for 3D simultaneously projects the Left and Right eye images to give the benefits of a dual projection system from a single projector. 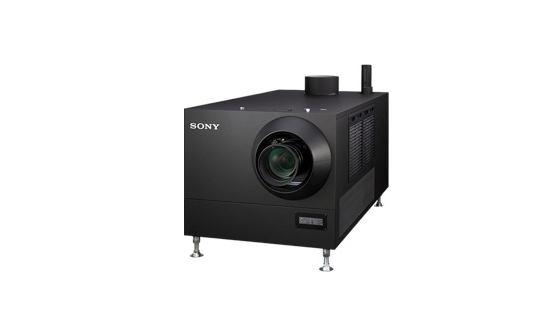 Sony projection systems have the flexibility to allow the exhibition of mainstream movies with the opportunity for additional revenue streams from exhibiting high quality video-based Alternative Content. The display of lower resolution 2K and HD content is enhanced through automatic up-conversion to a 4K equivalent image before projection. Sony is uniquely the only supplier able to provide the complete digital cinema projection system comprising projector, cinema server and highly integrated screen management system. For larger installations Sony can also provide its STM-100 Theatre Management System software to handle scheduling management and status monitoring across a large cinema complex. HD is already becoming established as a mainstream consumer format at a time when many cinemas are installing digital projection offering a similar resolution. While the bulk of movie distribution is currently done at 2K, movie production and distribution is increasingly choosing to work at 4K. Choosing Sony 4K projection allows exhibitors to benefit from compatibility with today’s 2K movies and offer the enhanced experience of 4K today and throughout the lifetime of the investment. Conforms to the DCI’s forward-looking 4K image standard. 4K is the highest resolution standard defined in the DCI Specification and, at 4096 x 2160 pixels, is FOUR times the resolution of 2K (2048 x 1080) and HD (1920 x 1080). Sony’s unique dual lens system displays 3D movies at their native 2K resolution. The dual lens combined with RealD technology projects the Left and Right eye images simultaneously to achieve crisp 3D images. The SRX-R320 digital cinema system has the flexibility to store and display both 4K and 2K DCI compliant cinema files as well as HD video via its Alternative Content input. 2K and HD alternative content is automatically up-converted by the projector to display a 4K equivalent image on-screen. The single 4.2KW Xenon lamp delivers the SMPTE brightness level of 14 ft-L on screens up to 17 metres in width (gain 1.8). The SRX-R320 body structure which surrounds the built-in LMT-300 Media Block forms a security enclosure specifically developed to comply with the FIPS-140/2 physical security and anti-tamper requirements specified by the DCI. The SRX-R320 projector can be used with a range of Xenon bulb sizes to provide optimum brightness on a range of screen sizes. Xenon bulbs for the SRX-R320 are available from a number of recommended manufacturers including Ushio, Osram and Philips. The Sony projection system incorporates sophisticated Screen Management System (SMS) software to enable control from the projectionist’s colour touch screen on the rear of the projector or from a dedicated PC. Screen Management System functions include; Movie and key ingest management, show playlist management and playback control. Laser projection promises a range of exciting benefits for cinema exhibitors. Read our white paper and discover how this new technology measures up. British rockers Muse are smashing records whilst using our 4K projectors. Remastered as a 4K DCP movie title. Snowden (2016). Released as a 4K DCP movie title. The Tales of Hoffmann (1951). Released as a 4K DCP movie title. The Third Man. Released as a 4K DCP movie title. Hail, Caesar! Released as a 4K DCP movie title. Bastille Day. Released as a 4K DCP movie title.